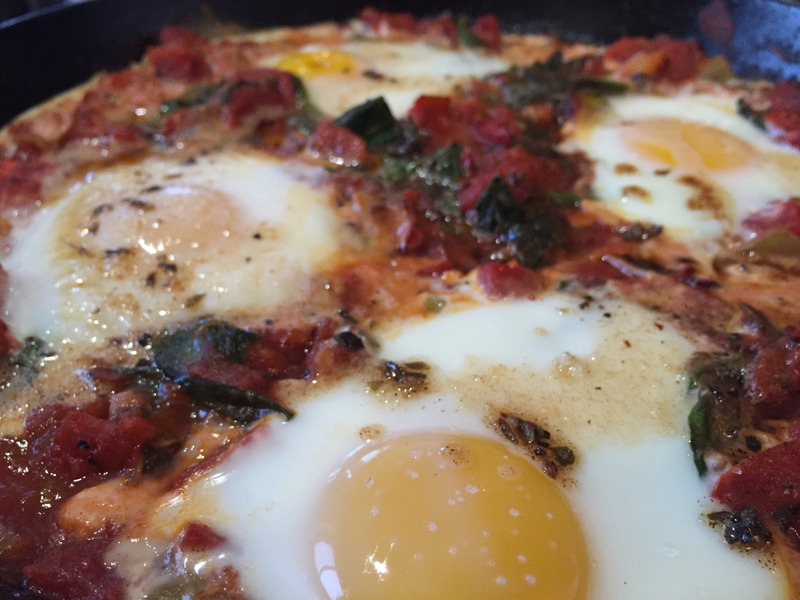 Saucy Baked Eggs with Spicy Browned-Butter – A Healthy Pinch. Mix yogurt, garlic clove and a pinch of sea salt in a small bowl; set aside. Preheat oven to 300°. Melt one tablespoon butter with olive oil in an ovenproof skillet over medium heat. Add leeks and scallions; reduce heat to low and cook until soft, about 10 minutes. Add spinach and lemon juice: season with salt. Increase heat to medium-high and cook until spinach is wilted, about 4-5 minutes. Add the fire-roasted tomatoes and stir the mixture together until combined. Remove from heat. 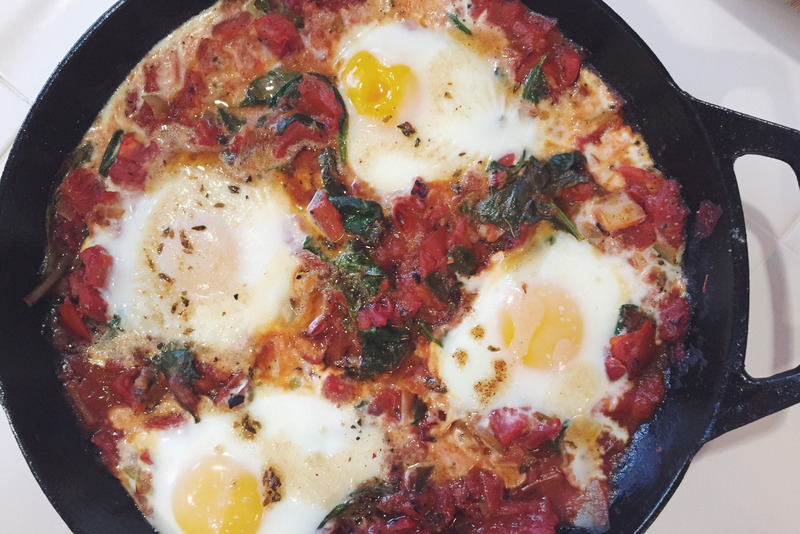 Make 4 wells in the spinach-tomato mixture for the eggs. Carefully break 1 eg into each hollow, making sure to keep yolks in tact. If you feel more comfortable, break each egg into a small bowl and then pour into each hollow (I did this because I’m not confident that we wouldn’t be eating shells otherwise!). Bake until egg whites are set, about 10-15 minutes. Melt remaining tablespoon butter in a small saucepan/skillet over medium-low heat. Add pipelchuma (or chili flakes) and a pinch of salt and cook until butter starts to foam and brown bits form at the bottom of the pan– about 1-2 minutes. Add oregano and cook another 30 seconds or so. Remove garlic cloves from the yogurt and discard. 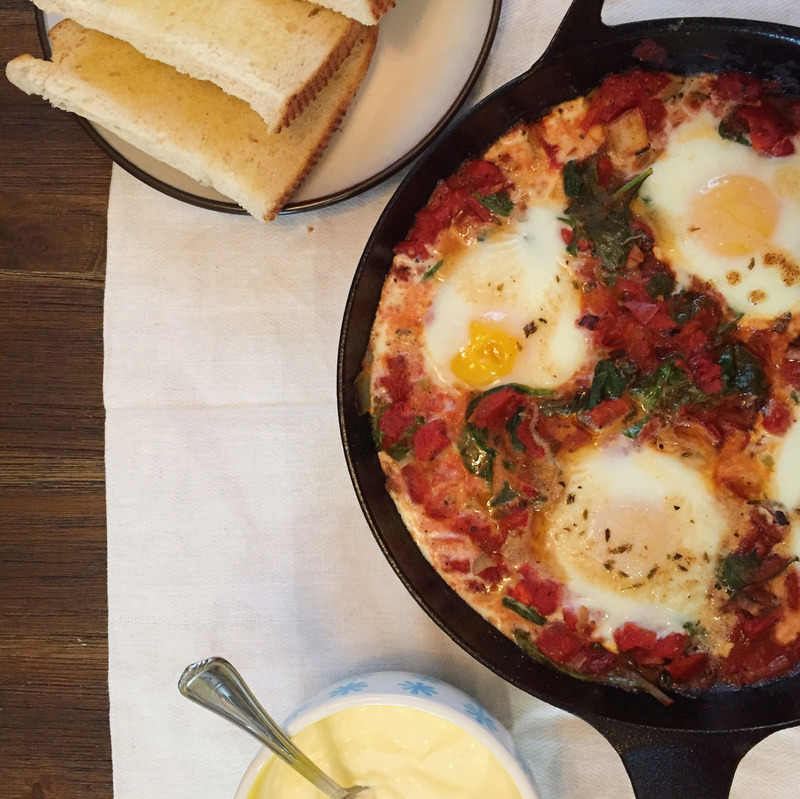 Dollop yogurt over spinach/tomato/egg mixture. Drizzle with spiced butter. Serve with pitas, crusty baguettes or toasted sourdough to mop everything up!